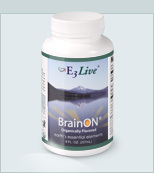 4x More Times PEA - the "Molecule of Love"
E3Live BrainOn® Supreme formula is the same live frozen BrainOn formula, but with 4 TIMES the PEA of original E3Live® BrainON®. PEA is the proprietary extract named phenylethylamine (PEA) also known as the "molecule of love" which is naturally produced in the brain, especially when we are in love or experiencing intense happiness and joy. This is powerful stuff folks! If you need to give a presentation under pressure, if you need to do well on a test, if you must excel at a job interview then super charge your brain with E3Live BrainON® Supreme. It can balance your mood and increase your focus and attention, so you can shine everyday in demanding situations. Be at Your Best Everyday in Stressful Times. PEA has been shown to enhance concentration, attention and create a feeling of well being. Suggested Use: To protect freshness, keep frozen. For fast defrost, place bottle in cool water outside of refrigerator for about 15 minutes. For slower defrost, place full bottle in refrigerator compartment for a few hours. Defrosting times will vary.